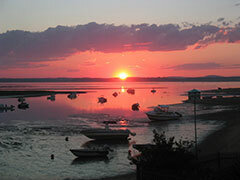 ReVision Customer Kincade Webb lives on picturesque Plum Island, Newburyport, Massachusetts. He had a solar array installed by ReVision Energy in 2014 and shared some incredible numbers – over 7,000 kWh generated in its first year (slightly more than our predicted performance figure). He shared his thoughts on being a solar owner – especially in an area dominated by solar leases. RE: Tell us a little bit about yourself – how did you get interested in solar? KW: My interest in solar was a mix of “good for the environment” and “long-term economic benefits” but good for the environment was primary. I would have done solar anywhere I lived if my roof was in a good position for it, and it happened that my home on Plum Island was ideal: no trees, no chimney on that side of the house, lots of sun. It seemed like a huge waste to not take advantage of all that solar potential! RE: How did the installation go? Did it meet your expectations? KW: The staff at ReVision were very helpful all the way along. The install went smoothly, and the office did all the copious and complex paperwork to get us set up and approved. Because of the availability of SRECS (Solar Renewable Energy Credits) this was a bit more complicated than anticipated but ReVision’s staff helped with all of that. RE: You chose to purchase the system outright vs. leasing it (which is common in Massachusetts). How has that worked out? KW: We looked at leasing 3+ years ago, and while spending no money is a nice idea, you also get very little. Yes, you get to lock in a fixed rate for the power you make, but you pay market rate if you use more than you make and it makes it harder if you ever have to sell your house. The leasing company gets all the tax breaks and SRECs etc. So although you spend nothing, you also get nothing. They really rent your roof and make money. Contrast that to the ownership model (either purchased outright or financed) – we were able to take the 30% federal tax credit, state incentives, and revenue from the sale of SRECs. Thanks to the forward-thinking policies of Massachusetts, we can expect our system to be ‘net positive’ in around 3 years, and then continue producing free power for 40+ years. Solar adds value to your home, reduces your dependence on the utility company, and helps preserve the environment… How can you go wrong?